When I am out of ideas but want to make something a little different, I like to see what I have in the fridge and try to come up with creative ways of cooking with leftovers. If you only buy items you like at the grocery store, then you should always be able to come up with something delicious. I had red peppers and cauliflower left over so I decided to google recipes that contained these ingredients. This is a great way to use leftovers. There are several "recipe finders" out there and, of course. you can always google it. There are even "recipe finder" applications available on the iPod Touch. I also wanted to make ginger tofu because I tried it at a restaurant yesterday and I really liked it. I have made tofu in the past but this was different than anything I had tried before. I found an "easy" ginger tofu recipe online that turned out to take more time than I thought but it was worth it. I often forget that anything that involves a marinade will take at least an extra 30 minutes. The hardest part about this recipe was waiting for it to be ready. We also made a stir fry with the peppers and cauliflower to accompany it. What started out as me trying to use my leftovers, finished in something pretty awesome. 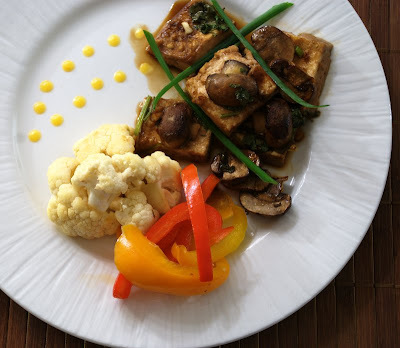 We baked the tofu but not as long as the recipe suggested and served it with the stir fry. I am becoming more and more comfortable with the idea of improvising when using a recipe but I still get nervous that it won't turn out perfect. We both loved it and will definitely try incorporate more tofu in our diet. There are so many possibilities.